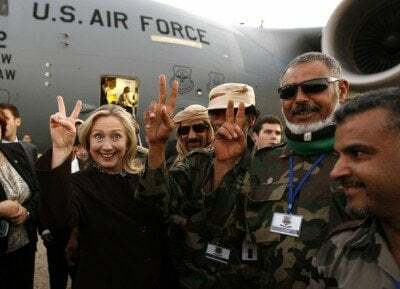 "Overthrowing Gaddafi and Confiscating Libya’s vast wealth"
Revelations that involve Hillary Clinton and her email scandal confirms what the real motives of the US-NATO led war on Libya to remove Muammar Gaddafi and it was not for democracy or to protect the Libyan people. It never was. There are several reasons why Western powers want Africa under their control besides their appetite for natural resources and that is to keep Africa under their control. Washington and Paris want to remain a dominant power politically and economically with their currencies in place instead of Gaddafi’s idea which called for the gold dinar to replace U.S. dollars and Euros. Africa is to remain a captive market under the West because it is their corporations and special interest groups who should profit. According to sensitive information available to this these individuals, Qaddafi’s government holds 143 tons of gold, and a similar amount in silver. During late March, 2011 these stocks were moved to SABHA (south west in the direction of the Libyan border with Niger and Chad); taken from the vaults of the Libyan Central Bank in Tripoli. This gold was accumulated prior to the current rebellion and was intended to be used to establish a pan-African currency based on the Libyan golden Dinar. This plan was designed to provide the Francophone African Countries with an alternative to the French.franc (CFA). Increase French influence in North Africa, UNCLASSIFIED U.S. Department of State Case No. F-2014-20439 Doc No. C05779612 Date: 12/31/2015 UNCLASSIFIED U.S. Department of State Case No. F-2014-20439 Doc No. C05779612 Date: 12/31/2015. Clinton declared that Gaddafi had a “campaign of violence against his own people” and that he “Defied the world” was a call for a US-NATO intervention. However, the actual planning stages to topple Gaddafi began shortly after the September 11th terror attacks in 2001 when former U.S. General Wesley Clark told Amy Goodman on Democracy Now that Washington planned to “take out 7 countries in 5 Years”, Libya was on that list. Washington’s history of regime change follows the same pattern of its past interventions and orchestrated coups. Non-Government Organizations (NGO’s) such as The National Endowment for Democracy (NED) granted $118 million by the Department of State (DOS) for the ‘Foreign Operations, and Related Programs Appropriations Act, 2010’ which covered North Africa and the Middle East. The DOS documents stated that “In authoritarian countries such as Iran, Libya, Syria, Tunisia, Bahrain and Saudi Arabia, NED will assist activists in working in the available political space, and try to strengthen their institutional capacity”. The “political space” would allow Washington and their European allies to fill that space to gain economic and political advantages. The NED then enlisted the help of the ‘International Federation of Human Rights’ (Fédération internationale des ligues des droits de l’Homme) or the FIDH along with the ‘Libyan League for Human Rights’ (LLHR). The NED, the FIDH and the LLHR and other U.S. funded “democracy promotion groups” or NGO’s such as the all too familiar operations of the United States Agency for International Development (USAID) launched operations in Libya to manipulate and guide social movements, labor organizations, student movements, news organizations and anti-Gaddafi activists. The role of the NGO’s in Libya was designed to change the political landscape that was more aligned with Western interests. It was planned several years before Gaddafi was toppled. But that was just one part of the destabilization process. Ali Tarhouni, the NTC’s oil minister, told reporters that Younes was murdered by “renegade” members of the Abu Obeida Ibn al-Jarah brigade. Named after one of the Prophet Mohammed’s companions and most successful military commanders, the Abu Obeida Ibn al-Jarah brigade is an Islamist faction that is one of at least 30 semi-independent militias operating in rebel-held eastern Libya, according to Noman Bentoman, a senior analyst at the London-based counter-extremism think tank, the Quilliam Foundation. His name is Abdelhakim Belhaj. Some in the Middle East might have, but few in the West and across the world would have heard of him. Time to catch up. Because the story of how an al-Qaeda asset turned out to be the top Libyan military commander in still war-torn Tripoli is bound to shatter – once again – that wilderness of mirrors that is the “war on terror”, as well as deeply compromising the carefully constructed propaganda of the North Atlantic Treaty Organization’s (NATO’s) “humanitarian” intervention in Libya. Muammar Gaddafi’s fortress of Bab-al-Aziziyah was essentially invaded and conquered last week by Belhaj’s men – who were at the forefront of a militia of Berbers from the mountains southwest of Tripoli. The militia is the so-called Tripoli Brigade, trained in secret for two months by US Special Forces. This turned out to be the rebels’ most effective militia in six months of tribal/civil war. Already last Tuesday, Belhaj was gloating on how the battle was won, with Gaddafi forces escaping “like rats” (note that’s the same metaphor used by Gaddafi himself to designate the rebels). Luis Moreno-Ocampo told reporters at the UN in New York last night there were strong indications that hundreds of women had been raped in the Libyan government clampdown on the popular uprising and that Gaddafi had ordered the violations as a form of punishment. Western propaganda was another element that instigated the removal of Gaddafi. The MSM was the cheerleader for the US-NATO intervention in Libya from the start. NGO’s, various elements of the Libyan rebels with Al-Qaeda in the mix and Western propaganda all had a hand in the death of Gaddafi. Washington and Paris were behind the civil war between the Gaddafi forces and the Libyan rebels from the start. The worst part of the situation, Mr. Roggio said, is that Washington’s inaction in Libya has provided ammunition for some of the most radical critiques of the Obama administration’s overall policy toward the Middle East. Well, Hillary Clinton’s exposed emails and proof that other elements including the fieldwork of the NGO’s and US intelligence prove that Mr. Roggio is wrong. Libya’s war was basically about its natural resources (oil and gas reserves) and its gold and silver holdings with the possibility that a sovereign nation in Africa can free its people from the West and that is not what Western powers want. They want the Libyan people and all of Africa to live in debt peonage while exploiting their resources. Gaddafi was going to change that arrangement. Historically speaking, since the West (Europe and the US) has conquered and exploited Africa, not too many nations within the continent have actually benefitted and that even holds true today. Libya had gold, silver and oil to change the dynamics that challenged the US dollar and Euro hegemony in Africa and that would have added another dilemma for the establishment. The Libyan invasion was not to protect the people as Clinton once claimed; it was about overthrowing Gaddafi and confiscating Libya’s vast wealth. But according to Roggio, it’s all a “conspiracy theory”. The ultra-rich will get rich even by stealing if they have to, and that is something empires past and present do well. One thing is certain: Hillary Clinton’s emails are documents that historical revisionists will not be able to rewrite what Washington and its European allies were after all along in Libya and it was not democracy.